Agrostis bermudiana Tussac. ex Kunth nom. inval. Agrostis filiformis J.Koenig ex Kunth nom. inval. Chloris cynodon Trin. nom. illeg. Cynodon grandispiculus Caro & E.A.Sánchez nom. inval. Cynodon occidentalis Willd. ex Steud. nom. inval. Cynodon portoricensis Willd. ex Steud. nom. inval. Cynodon repens Dulac nom. illeg. Cynodon sarmentosus Gray nom. illeg. Dactilon officinale Vill. nom. illeg. Dactylus officinalis Asch. nom. inval. Digitaria littoralis Salisb. nom. illeg. Digitaria stolonifera Schrad. nom. illeg. Fibichia umbellata Koeler nom. illeg. Panicum ambiguum (DC.) Le Turq. Cynodon dactylon, also known as Vilfa stellata dūrvā grass, Dhoob, Bermuda grass, dubo, dog's tooth grass, Bahama grass, devil's grass, couch grass, Indian doab, arugampul, grama, wiregrass and scutch grass, is a grass that originated in the Middle East. Although it is not native to Bermuda, it is an abundant invasive species there. It is presumed to have arrived in North America from Bermuda, resulting in its common name. 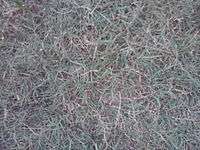 In Bermuda it has been known as crab grass. The blades are a grey-green color and are short, usually 2–15 cm (0.79–5.91 in) long with rough edges. The erect stems can grow 1–30 cm (0.39–11.81 in) tall. The stems are slightly flattened, often tinged purple in colour. Cynodon dactylon is widely cultivated in warm climates all over the world between about 30° S and 30° N latitude, and that get between 625 and 1,750 mm (24.6 and 68.9 in) of rainfall a year (or less, if irrigation is available). It is also found in the U.S., mostly in the southern half of the country and in warm climates. Bermuda grass has been cultivated on saline soils in California's Central Valley which are too salt-damaged to support agricultural crops; it was successfully irrigated with saline water and used to graze cattle. The hybrid variety Tifton 85, like some other grasses (e.g. sorghum), produces cyanide under certain conditions, and has been implicated in several livestock deaths (note that in several places this variety has been incorrectly reported as a genetically modified strain; actually it is a conventionally bred F1 hybrid). ↑ "Iraq". lntreasures.com. Retrieved 5 November 2015. ↑ Farsani TM, Etemadi N, Sayed-tabatabaei BE, Talebi M. Assessment of Genetic Diversity of Bermudagrass (Cynodon dactylon) Using ISSR Markers. Int J Mol Sci. 2012;13(1):383-92. 1 2 Walker, Karen; Burrows, Geoff; McMahon, Lynne (2001). Bidgee bush : an identification guide to common native plant species of the south western slopes of New South Wales. Yarralumla, Australian Capital Territory: Greening Australia. p. 82. ISBN 1-875345-61-2. Retrieved 21 March 2010. ↑ "Tenacity and Bermuda Control - LawnSite.com™ - Lawn Care & Landscaping Business Forum". Lawnsite.com. 2011. Retrieved 2013-06-08. ↑ Teuton T.C. ; J.B. Unruh; B.J. Brecke; G.L. Miller (2005). 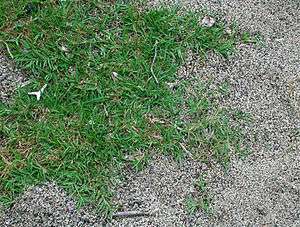 "Hybrid Bermudagrass (Cynodon dactylon (L) Pers. x C. transvaalensis Burtt-Davy) Control with Glyphosate and Fluazifop-p-butyl". Applied Turfgrass Science. doi:10.1094/ATS-2005-0119-01-RS. ↑ Kaffka, Stephen. "Can feedstock production for biofuels be sustainable in California?" (PDF). California Agriculture. 63 (4): 202–207. doi:10.3733/ca.v063n04p202. ↑ Stephen Kaffka; Stephen Grattan; Dennis Corwi; Maximo Alonso; George E. Brown Jr. "Bermuda Grass Yield and Quality in Response to Different Salinity and N, Se, Mo, and B Rates in West San Joaquin Valley" (PDF). UC Center for Water Resources. ↑ Provin, T. L.; Pitt, J. L. "Nitrates and Prussic Acid in Forages" (PDF). Texas A&M University System. Retrieved June 24, 2012. ↑ CBS News (June 23, 2012). "GM grass linked to Texas cattle deaths". CBS News. Retrieved June 24, 2012. ↑ Glenn W. Burton; Roger N. Gates; Gary M. Hill. "TIFTON 85 BERMUDAGRASS". University of Georgia College of Agricultural and Environmental Sciences. Retrieved June 24, 2012. ↑ Shi H, Wang Y, Cheng Z, Ye T, Chan Z. Analysis of natural variation in bermuda grass (Cynodon dactylon) reveals physiological responses underlying drought tolerance. PLoS ONE. 2012;7(12):e53422. ↑ "Tifway 419 Bermudagrass Turf Grass - Phillip Jennings Turf Farms". www.sodfather.com. Retrieved 2016-05-10. 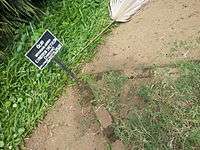 Wikimedia Commons has media related to Cynodon dactylon.